When people ask me, “Why pirates?” I almost always reply "Johnny Depp". He was, after all, the star who sent me into my grown-up pirate obsession. But he wasn’t my FIRST pirate. 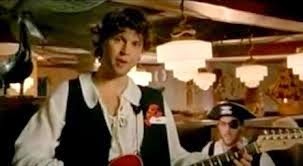 The first pirate I remember came on a TV commercial, many, many years before. His name was Jean LaFoot, and he was the bad guy in the Cap’n Crunch TV commercials. 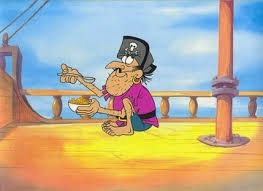 Originally voiced by Bill Scott, LaFoot, the barefoot pirate, was constantly trying to steal Cap’n Cruch’s cereal. When not doing that, he was attacking the good captain, or the kids who followed him, or trying to sink the good ship Guppy. When not in commercials, he co-starred in a series of mini comic books that came inside the cereal boxes. His popularity was large enough that, when a spin-off cereal was invented, he was made the mascot for it. See a commercial here. Although I was very young at the time, something about the barefoot pirate stuck with me. I remember asking my mom if he was a real person. 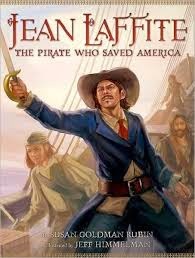 He wasn’t of course, but many years later, I found out that his name had been based on Jean Lefitte, an early 19th century French pirate who operated out of New Orleans, and is most famous for supporting the Americans during the War of 1812. Of course, most pirates in commercials are more stereotypes and less history. This very old ad for FedEx limits the pirate down to a parrot, a hook and an eyepatch. The message is simple… If this guy can run the FedEx software, you can too. 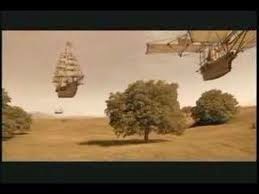 Other commercials evoke the yearning for freedom and the deep longing of the imagination that makes pirates so popular. This ad is for Clorox, a cleaning product that is most definitely not associated with pirates or the piratical lifestyle at all. Pirates have the ability to be cute. Who makes a better spokesperson for eyedrops than an eyeball? And what gives an eyeball personality? Well, if it’s dressing up as a pirate (including the eyepatch) that’s pretty cute. And, more recently, the hook hand of a pirate has figured in another "eye ad". Sometimes the pirate theme gets out of hand. This Bud Light commercial is just confusing... 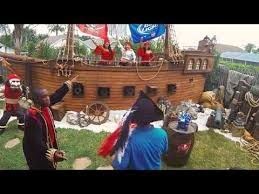 If you drink our beer, your living room will be transformed into a pirate lair, and a pirate ship will appear in your backyard? One suspects that the audience is already supposed to be drunk to cheer for this ad. There is the disclaimer that the winner of this strange contest has a wife who agrees to the make-over of her house (including the cheerleaders on the boat?) It's fun during the time the ad is running, but not much an incentive to drink this particular beer. Another of the most distinctive pirate commercials in recent memory is the one for FreeCreditReport .com. It’s interesting that the Free Credit Report offer has itself been identified as a scam. The “free” report they were offering came only if the user signed up for a service that cost, and truly free credit scores are available by other means. But the series of ads produced, leading off with the pirate-themed commercial offered here, were distinctive and very fun to watch. Of course, the theme restaurant alluded to here is Long John Silver’s. I wasn’t going to list any ads that were actually advertising pirates… No pirate movies or pirate toys, etc. But some people may not realize that the fast-food seafood franchise was names after Robert Lewis Stevenson’s famous pirate character. It was okay, because Stevenson had been dead for over 100 years, and any copyright had long since expired. 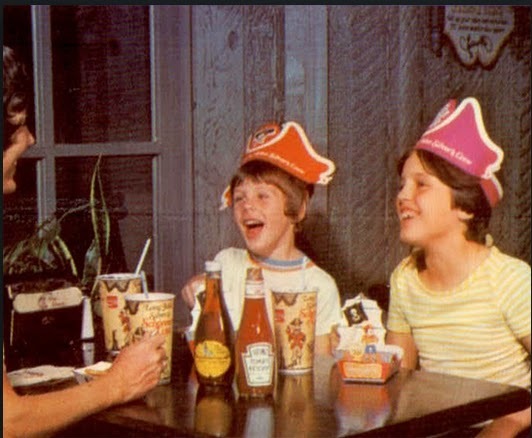 Older commercials – this one dates from 1978, played a lot more heavily on the pirate theme than more modern ones. But the chain is still faithful to its pirate roots. It offers free food to anyone dressed like a pirate on September 19th (talk like a pirate day). 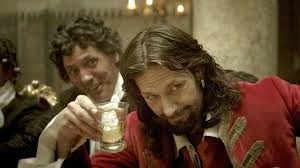 And last, of course, are the ads for Captain Morgan rum. The rum is named after a real 17th century buccaneer, who really wore a red coat, had facial hair much like the guy pictured on the bottle, and sailed a ship called the Satisfaction. The earliest commercial I could find references pirate comradery. A group of barflies come to the aid of a friend who is busted by his girlfriend for not attending her cousin’s wedding. There’s not a lot of pirate reference until the end. 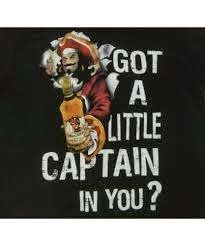 Captain” as a character. A string of ads chronicled a series of adventures in a world that does in fact look a lot like the Caribbean that the real Morgan moved around in. Strung together, they make a nice few minute’s entertainment. What the rum company probably doesn’t want you to know is that, after a lifetime of adventure, the historic Morgan died from liver failure due to his heavy drinking. But, hey, while pirates are great at advertising food, drink, adventure, staying up late and general fun, I doubt we’ll ever see a pirate advertising an old-age home.